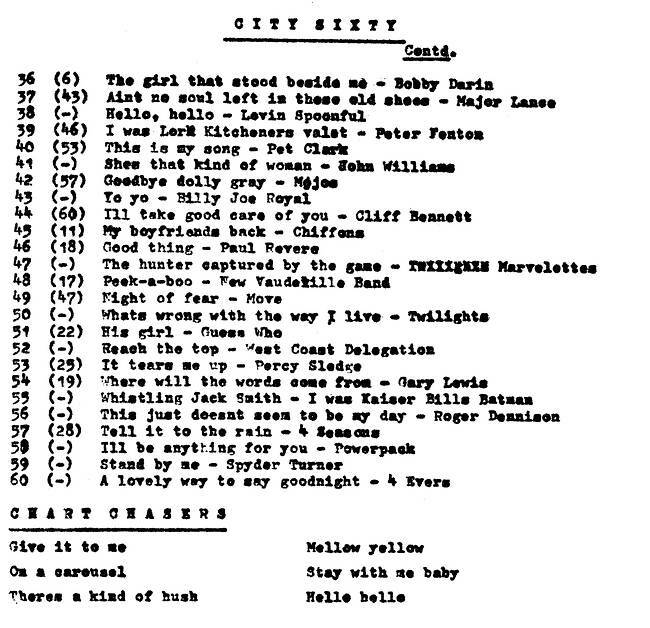 This was the last chart to be issued by Radio City. On 8th February 1967 the station owner Dorothy Calvert was found guilty of operating a radio station inside UK territorial waters. Radio City closed down at midnight that night. There is more about the history of Radio City, and its predecessor Radio Sutch, here. 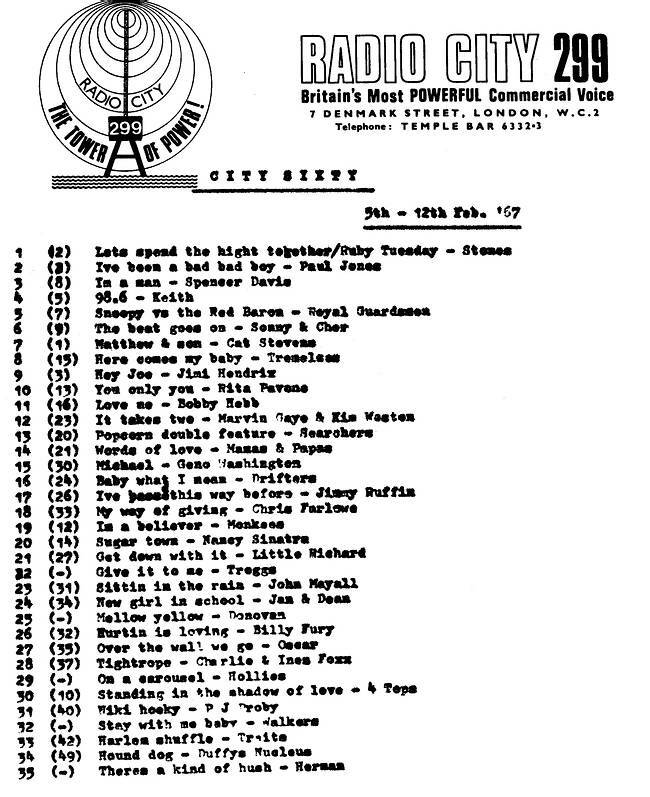 * The published chart shows Hello, Hello by The Lovin' Spoonful at number 38. We haven't been able to track that single down but there was a song of the same name released on 3rd February 1967 by the Spoonful's label-mates, Sopwith Camel. It looks like someone got the two bands confused. ** The Pirate Radio Hall of Fame has heard from Roger Denison, alias Roger Watson: “I was a plugger for Decca Records in the sixties and knew (Radio City DJ) Phil Jay. He heard me singing at a party one night and took me into the studio. He produced and recorded the song, and got me a deal with EMI Parlophone. I was famous for 15 minutes thanks to Phil. He got me the pop slot on the London Line TV show (produced by the Central Office of Information). You can see it on YouTube. ‘This Just Doesn't Seem To Be My Day’ was originally by the Monkees. The disc's release coincided with my changing jobs from Decca to Major Minor, owned by Phil Solomon, who also happened to have Radio Caroline in his portfolio. Radio London then dropped the disc like a shot, but it went on the Caroline chart! I am thinking of re-recording the B-side for my upcoming birthday - the fiftieth anniversary of the release date!” Thanks to Roger for getting in touch. Radio Scotland's Top 60 is here.